The developments around Syria and the trade war is putting EURUSD under pressure and USD is being considered as safe haven at times of risk. 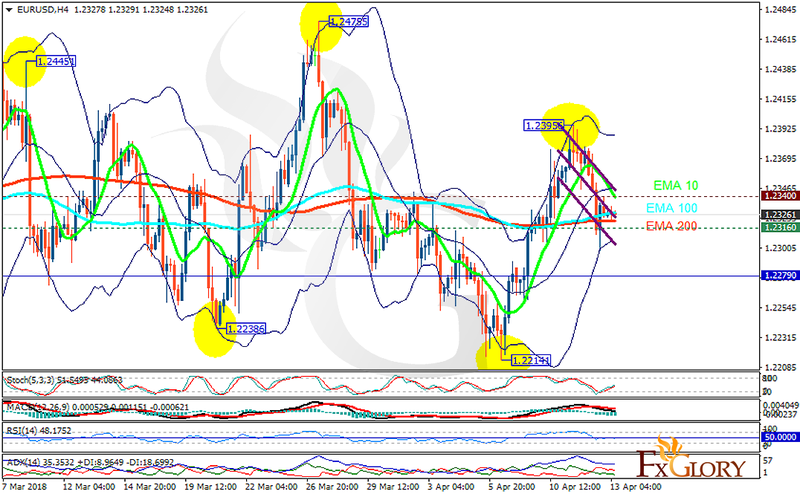 The support rests at 1.23160 with resistance at 1.23400 which both lines are above the weekly pivot point at 1.22790. The EMA of 10 is moving with bearish bias in the descendant channel and it is above the EMA of 200 and the EMA of 100. The RSI is moving on the 50 level, the Stochastic is showing upward momentum and the MACD line is below the signal line in the negative territory. The ADX is showing weak sell signal. If the price falls below the lower Bollinger band, it drops to 1.21 otherwise, long positions are recommended towards 1.24.